Opening April 3rd at EFA Project Space, Common J ive presents a spectrum of contemporary artists who summon up vernacular and traditional craft approaches in their art-making practice. 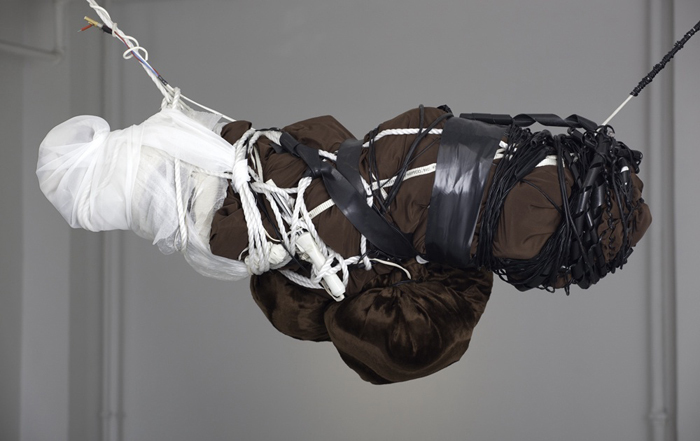 Organized in a collaborative effort between curator Julie Fishkin, and artist Saya Woolfalk, the fifteen artists in the exhibition engage the dichotomy between communal pasts and the individual experience, intertwining them visually through the manipulation of common materials and reexamination of time-honored aesthetic practices. Some of the artists look to traditional approaches as means to critique and investigate current political or cultural concerns. Brent Owens conjures the aesthetic of Appalachian woodcraft with his chainsaw carved sneakers and whittled basswood laces to comment on the generic nature of mass production. The objects recall the familiarity of a pair of Nikes or Air Force Ones while remaining a nameless copy, albeit a hand-made one of a kind. Nate Kassel embroiders throw pillows, utilizing the language of domestic decoration, as an unexpected platform for his sarcastic and humorous social commentary, while Maria Pineres uses the traditional craft of her Colombian origins to create intricate needlepoint “paintings” that illustrate pop culture and its icons at their most decadent. Other artists in the show act as collectors, foraging for relics and combining them with contemporary artifacts and visual icons. Milton Carter’s “Self-Portrait: A Hobo Pop-Up Shop” is an accumulation representing the artist’s fascination with the life of “things” and lifelong collection of esoteric ephemera found in local yard sales, thrift stores, and flea markets. 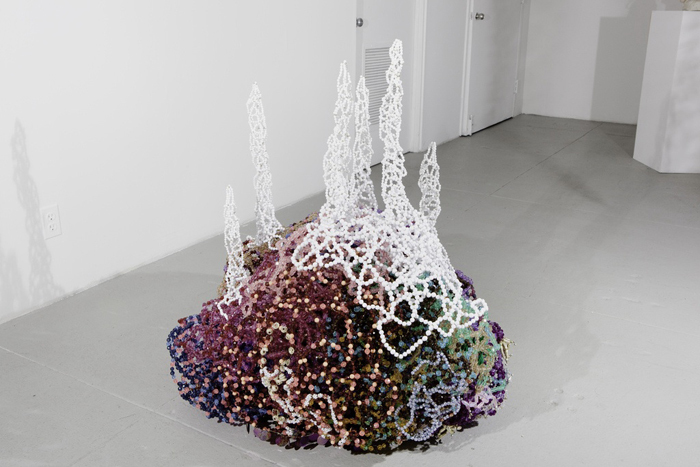 With Scott Andresen and Ai Kijima, scavenged material is integrated with a multitude of other materials in their work. Andresen’s found artifacts or discarded detritus are woven into his detailed quilts, narrating the lives of a thousand nameless individual histories, while Kijima also uses quilted collage to illustrate a both a historical and contemporaneous commentary on the iconography of pop culture. In Megan Whitmarsh’s new work “Color Work Station,” the artist constructs an impression of a studio or what she calls a “meta studio.” Cheerfully awkward and self-conscious, the work “celebrates the process of making art” while making the often private and perplexing artist’s workspace palpable. Pushing the theatrical potential of hand-constructed elements, some artists construct platforms for their own created narratives, building intricately detailed environments. Kate Gilmore’s sets are designed to provide her self-played protagonist with an endless array of difficult physical tasks, which she documents herself, dolled up in a variety of feminine frocks, obsessively attempting to conquer. Karen Azoulay’s lush fabricated backdrops play more to the desires of whimsy. Although satisfyingly fantastical, her materials and labor remain transparent, ever reminding us of the human hand that created these mythic worlds. Shana Moulton engages in an imaginative interplay with commonplace items, as her devised protagonist navigates possible magical properties of her home décor.